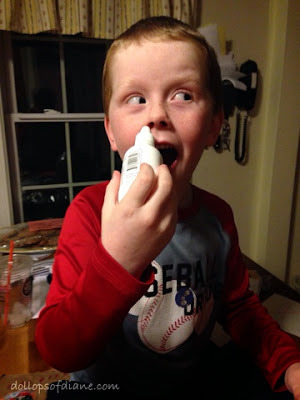 Dollops of Diane: How Do You Get Food Out Of Your Kid's Nose? Today turned into one of those "never a dull moment" type of days rather quickly. The kids were enjoying a late afternoon granola bar snack. From the other room, I heard a weird gag type noise that I've never heard before. Apparently, that noise is the sound of a chunk of granola bar being lodged in the nose of a four year old. It was soon followed by crying and general freaking-out-ness by Daniel. It appears that it was a total freak accident and that he had his head back taking a bite and a part of the bar fell off and he inhaled it. When we got to the doctor the first thing the doctor had us do was basically mouth to mouth resuscitation. She explained to Daniel that I would just give him a "big kiss." This big kiss turned out to be me blowing as hard as I could in his mouth while she held his other nostril shut. You have to find the funny in that or else you might just lose your mind. So we had a couple of attempts with that but no luck dislodging it. Part of the problem was that his nasal passages were swollen just due to his general state of allergies, etc. So the swollenness was making it more difficult for the granola bar to come out. She explained that they have several tools used to remove objects from the nose but they are mainly used for hard objects like beads. The staff was pretty baffled as to how to get gross, gooey, granola out of the nasal cavity. Leave it to my troublemaker to stump the staff. So we continued with blowing his nose for a while in the office and eventually a piece came far enough down that she could dig it out with a scooper. Even after that piece came out though there were still visible pieces left up there that wouldn't budge. She suggested that we give him some allergy medicine at home to reduce the swelling and buy some saline drops to keep the granola-bar-infested nose moist. The concern is that it will harden and be (more) difficult to remove. Ideally the pieces will come out his nose or go down his throat. The concern is that they would travel into his sinuses and cause infections/problems. They also can't rule out that there is additional granola bar farther up his nose that they can't see due to the swelling. So regardless of if the pieces find their way out or not, we are off to the ENT tomorrow to confirm he is granola bar free. I'm not psyched about this appointment since I'm sure he's fine but I understand that they want to be thorough. Luckily, part of it came out in the doctor's office so they didn't think it was necessary for us to go to the ER. So that's our silver lining. Seriously though, GRANOLA BAR up the nose? This is one for the record books.